Ameda – More than 75 years ago, a Swedish engineer, Einar Egnell made it his life’s work to help breastfeeding mothers. After years of research, Egnell created the first comfortable and effective breast pump that closely mimics the suckling rhythm of nursing infants. In the process, Egnell also created the vacuum and cycling standards that have since become the industry benchmark. Founded in 1961 by Olle Larsson in Zug, Switzerland, Medela continues to grow under the ownership of the Larsson family. The company entered the United States more than 25 years ago. Medela provides the most technologically advanced, superior-quality breast pumps and breastfeeding accessories to nursing mothers around the world. A longtime champion of breastfeeding, Medela is the only company to develop products based on research by the world’s leading lactation experts. As a result, Medela’s breast pumps are the number one choice of healthcare professionals and healthcare facilities worldwide. More Medela accessories and parts here. Both Ameda and Medela are trusted brands plus they are popular and well rated, that is why moms love them so much. Not all mothers are privileged enough to be able to purchase and get the chance personally use and compare each product from brands. That is why at pumpingdoctor.com, we are always ready to help you with choosing and considering which will be best for you. The key features presented in this article are taken directly from their respective websites so you’ll know we didn’t make them up. Weight 1 lb. 2.2 lbs. The Ameda Finesse is a light-weight, personal use double breast pump that has the option to run on batteries making portable and easy to use even when on the go. It features the technology and pump rhythm of the Ameda hospital grade pump, the Ameda Platinum. This makes the Finesse very comfortable to use and very efficient! It comes with a ton of accessories including a tote bag making this a great option for moms who are on the go! This Ameda breast pump also boasts quiet technology which makes pumping less noisy. The Ameda Finesse is a great pump with a lot of features and accessories, although some mothers do not love the dial settings. This will work great for working moms and mom who need to pump a lot. It is portable, comfortable, and a strong pump. The Medela Sonata is a double electric, single-user breast pump. It features their hospital grade technology from the stand-out Medela Symphony. Most mothers love and appreciate that this pump is extremely light and compact, making it easy to carry and use. The Medela Sonata has a very effective pumping action and comes with clinically tested rhythms. This allows mothers to choose which one will work more effectively for her. This pump is also extremely quiet, therefore letting you pump without disturbing other people around you. The best thing about the Medela Sonata is that it makes pumping effortless. Mothers don’t have to know how to manually set your pump to stimulation and expression modes as you would with a pump that has manual dials. The Sonata starts out automatically in stimulation mode and switches to expression mode for you. And there is a Letdown button which you can press if your milk lets down before the 2-minute setting. Weight 5.9 lbs. 7 lbs. Proven Airlock Protection™ barrier helps protect milk while keeping pump tubing dry and clean. No need to clean the tubing. The Ameda Purely Yours is a closed system pump that has an adjustable speed and suction to find the best setting that will fit every mom. 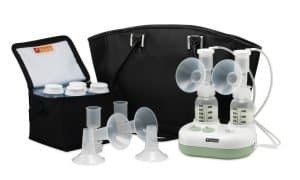 This breast pump is extremely compact and lightweight, plus this comes with a tote bag that includes a cooler with an ice pack and six storage bottles that can fit just right into the bag. The Ameda Purely Yours has also three power options which include AC power, battery, and car adapter. Although this is a closed system, there are lots of small parts which are difficult to clean and prone to breaking and damage. The suction of this pump is also quite good but mothers will have to get to know this pump before being able to comfortable with it since the motor of this pump has dials instead of buttons for adjusting and setting but once everything will be fine for you, this pump will be good to go. 2-Phase Expression technology with one-touch let-down button. Medela breast pumps feature research-based and patented 2-Phase Expression technology which is shown to get more milk when double pumping. The Medela Pump in Style Advanced breast pump is a double electric breast pump with an integrated carrying case, this pump also works best for moms who express milk several times a day. The Medela pump set (some sets may vary) includes tubing, battery pack with storage cage, AC adapter, four Medela bottles, breast shields, two valves, four membranes, two personal fit collectors, four bottle lids and a cooler with an ice pack. This double electric pump is perfect for every mom who pumps a lot since it is designed to be used several times a day and as a double pump. 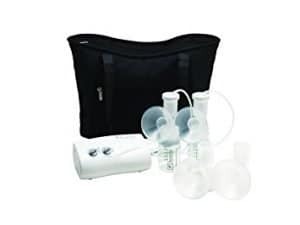 Another plus for these portable breast pump is that its bag is insulated and comes with a reusable ice pack that fits four breast milk collection bottles. This feature helps a lot if you don’t have a refrigerator available in your workplace and it also keeps your milk cold and keeps the bottles upright as well so you won’t have to worry about spillage. When it comes to style, this breast pump provides a selection of black microfiber style bags. This includes the Back-Pack, On-the-go Tote, and The Metro Bag. Not only that this breast pump is really chic and portable, this stylish pump delivers too. Tons of mothers rave about how efficient this breast pump is, from the double pumping ability to its two-phase expression. The Ameda manual pump is extremely lightweight and is ideal for moms who are looking for a compact and easy to carry the pump. Assembling this breast pump is a very easy and the breast shield is already attached to the pump. This manual pump boasts its versatility when it comes to collection, this can directly pump to most branded and standard baby bottles. The handle is set at a very different angle than with most pumps so it takes some getting used to if you have been used to the traditional models before, but it works fine once you have gotten familiar with it. A drawback to this pump is that after a few of uses, the handle starts to squeak a bit load. The issue is easily corrected, though, by applying a bit of Vaseline or any lubricant to the pump joints. Since this unit doesn’t have two-stage pumping it will be somewhat less comfortable to use over the long term, but putting that aside, this pump is still comfortable enough. Cleaning is very easy as well. The Medela Harmony is quite unique compared to other manual breast pumps since Medela has found a way to implement the same computer-controlled “two-phase expression” approach in a manual pump. The Harmony’s manual-tech approach is to provide two separate pumping levers, one for a let-down and one for expression; you simply use the first, shorter lever to start and switch to the longer lever when the milk is flowing. 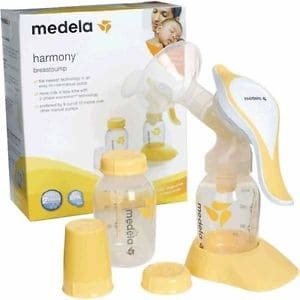 The Medela harmony is very easy to use. As long as your hands can pump very well, you’ll find that you can express milk as quickly and efficiently as with an electric pump. Putting the unit together is easy, the pump and swivel handle attach to the collection bottle, the collection flange attaches to the pump, and then you are already set to pump. It comes apart in seconds, too, and is easy to clean and dishwasher-safe. The breast shields aren’t padded, but this is still a very comfortable pump to use since you control the speed at which it expresses milk, and the two-stage design lessens breast soreness. Another thing this Medela pump is awesome for it is how quiet it is. All manual units are going to be much quieter than electric ones, but the Harmony is totally and extremely quiet. You truly can use it anywhere without other people, who are not looking, notice that you are pumping. 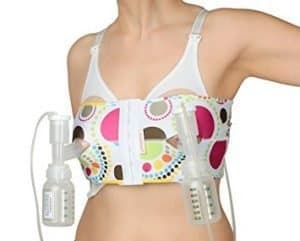 PumpEase hands-free pumping bra is not a bra in itself, but rather a support that is designed to fit over your nursing bra when it’s time to pump. It’s designed to work with a nursing bra. The PumpEase hands-free pumping support will hold your breast pump in place as securely and comfortably for your pumping session while keeping your hands free so that you can continue to work. Attractive, cute designs and fun colors that are available and it comes in a wider size range. Easy care, machine wash cold in a garment bag on gentle cycle. Tumble dry low. Similar to the Ameda PumpEase, the Medela Easy Expression is not a bra but rather a support that is designed to be used with nursing bras. This bustier gives enough support during hand-free pumping while you are doing other chores and even at work. Medela is a good choice with a slightly cheaper price tag. This is a good option if you are working with a budget. 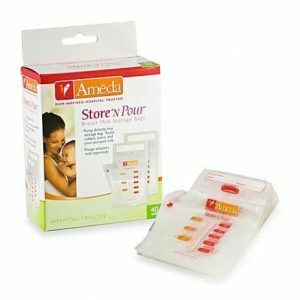 The breast milk storage bags from Medela are very easy to use and very convenient since they easily attach to any Medela pump for direct pumping into the milk storage bags. These storage bags are made of durable BPA free plastic and are double walled for long-term storage. The simple design of the leak-proof double zipper seal makes the bags easy to close and seal, these bags are also made with a high-quality bottom to prevent and avert spills. 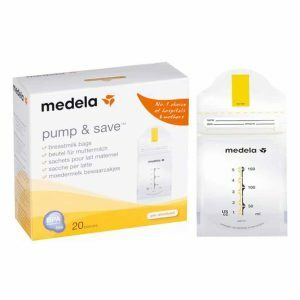 The Medela Pump and Save breastmilk storage bags have a protective oxygen barrier to preserve the nutrients and maintain the freshness of your expressed breast milk. These storage bags also has a good space for labeling and stand up well or lay nicely flat in the freezer or the refrigerator for a good space saving storage. Both Ameda and Medela are good choices when it comes to breastfeeding products. They differ mostly only on the price tag and some features but all in all, they are both helpful in your breastfeeding journey, you just need to choose and decide which of them will work best for you in terms of budget and certain features.